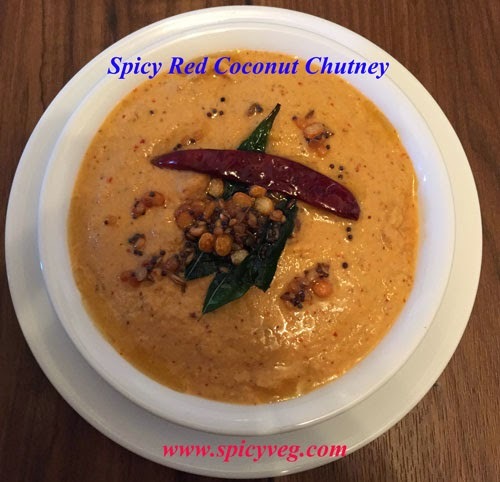 This spicy red coconut chutney is quick and simple.This chutney goes well with idlis, dosas.It is commonly prepared for breakfast in South India and is one of the easiest chutney recipe. 1. Grind coconut ,pearl onions, garlic,ginger,Red chillis,salt and little water to make a smooth chutney. Start with a few tbsp of water and adjust as you go. 2.Heat oil for tempering, add the mustard seeds and when they pop, add the urad dal. When the urad dal turns golden brown, add the red chilli and curry leaves. 3.Remove from flame and pour into the ground chutney. Mix well. 4.Serve spicy red coconut chutney with Idli /Dosa .